Pittsburgh, PA – Governor Tom Wolf joined local officials and workers at the IBEW Local 5 and Western Pennsylvania Chapter of the National Electrical Contractors Association Apprenticeship Training Center in Pittsburgh today to announce a $10 million investment in apprenticeships and other job training opportunities for Pennsylvania workers and the economy through his PAsmart initiative. The governor’s PAsmart initiative is a new and innovative $30 million investment in job training to focused on fast-growing, in-demand jobs. The initiative is built on recommendations of the governor’s Middle Class Task Force, which included leaders from f the Pennsylvania AFL-CIO, Pennsylvania Chamber of Business and Industry, education, and workforce development. $7 million for apprenticeships with a goal of doubling the number of registered apprentices by 2025. 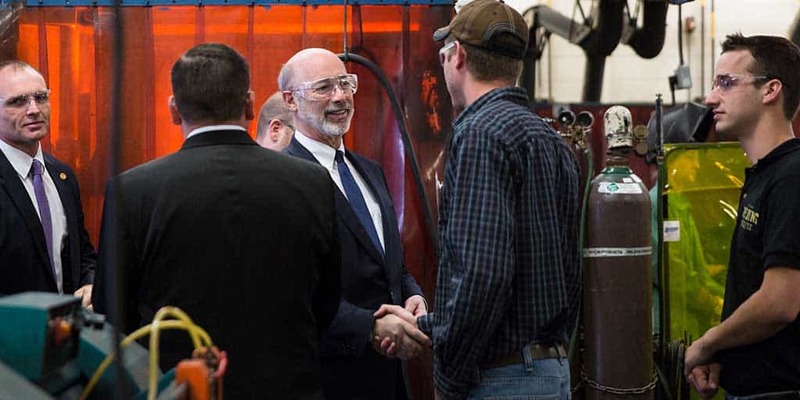 Since Governor Wolf established the commonwealth’s first Apprenticeship and Training Office in 2016, the number of registered apprentices has increased by nearly 20 percent from 13,282 registered apprentices to 15,972 statewide. $3 million increase for Industry Partnerships which bring together workers and multiple employers in the same industry in a public-private partnership to provide job training. $20 million for STEM and computer science education at all levels. Nearly 300,000 jobs in the commonwealth require skills in Science, Technology, Engineering, and Mathematics (STEM). Over the next decade, more than 70 percent of new jobs will require these skills. Apprenticeship programs are often sought by businesses to provide employees with industry-driven training to create a more productive, diverse, highly-skilled workforce and reduce employee turnover. In turn, workers and job seekers gain increased skills, and nationally recognized credentials to support future career advancement and increased wages. Yesterday, the governor signed an executive order to cut red tape and improve coordination between several state agencies to more effectively deliver workforce development services to Pennsylvanians. The executive order places the Pennsylvania Workforce Development Board (PA WDB), the governor’s private sector policy advisor, in a leading role to coordinate job training strategies.